FANTASTIC was born unassisted at 94 lbs. and weighed 700 lbs. at 170 days of age. He is extreme in his muscle pattern, perfect profile, and 100% ring-eyed. A full sister topped our first internet sale at $13,000 and a full brother topped our 2003 sale selling to Chandler Herefords. 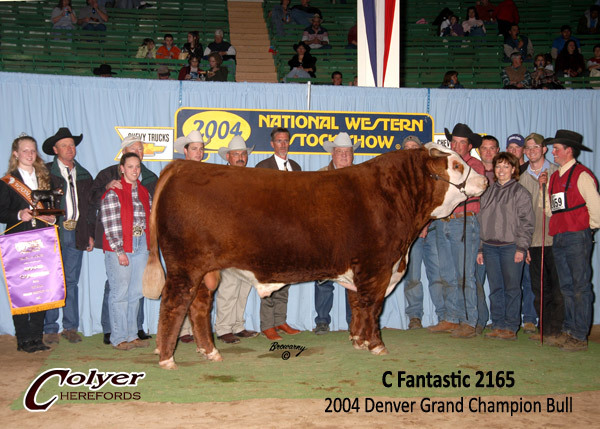 FANTASTIC was named the 2004 National Champion Hereford Bull at the National Western Stock Show in Denver, CO. His sire, 026K, has done a great job for us and many breeders across the U.S. 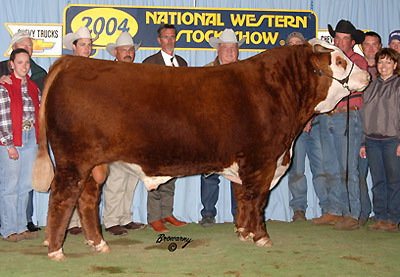 FANTASTIC's dam, Fantasia, earned the reputation as a great show female and now as a producer of herd bulls.